Refer to product label for warnings and indications. Use only as directed. Withdraw 24 hours prior to slaughter. 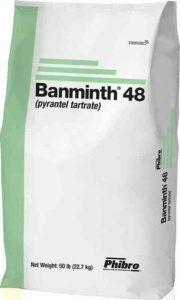 Banminth prevents migration of ascarid larvae before they cause liver and lung damage. It is a member of the class of synthetic compounds called tetra-hydropyrimidines and is chemically unrelated to any other parasite-control product used in swine. Banminth prevents and controls parasitic nodular worms in pigs. A truly versatile anthelmintic with a wide margin of safety, it can be fed to swine of all ages, including growing pigs, gilts, pregnant sows, herd boars and young breeding stock.